Sewing is popular with all ages and this series, Love to Sew, focuses on the latest hot trends. The 64 page handy square format gives us room for at least twenty projects, each with simple step-by-step instructions, beautiful photographs, as well as a basic techniques and materials section at the front of the book. Practical yet pretty, a mug rug is one of the latest trends on the sewing and patchwork scene. Basically it is a large coaster with room for your favourite mug and a biscuit or two. Small enough to complete in a few hours, but large enough to give space to your creativity, a mug rug is an ideal project for trying out some new techniques or even for getting to grips with patchwork, quilting or appliquÃ© for the first time. 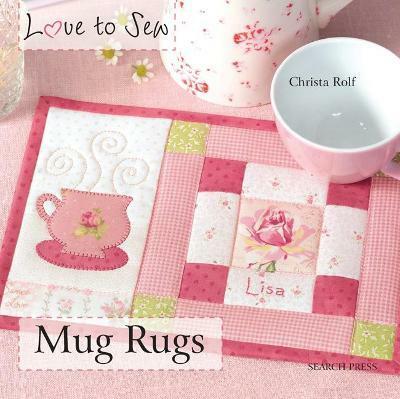 This book contains a selection of mug rugs designed by renowned international patchwork artists. Revel in the many different designs that can be achieved with various fabrics and techniques and, above all, have fun making your own mug rug.